Are the aged most deserving of more federal spending? Social Security is the most popular legacy of Franklin Roosevelt’s New Deal. Last year almost 60 million Americans received benefits from the program. Payments amounted to over $875 billion, nearly a quarter of all federal spending. For more than two decades, most discussion of Social Security, at least in Washington, has centered on its funding shortfall. Contributions to the program are not high enough to pay for all benefits scheduled under current law. The Social Security Trust Fund is expected to be depleted around 2030. If Congress does not address the funding problem before reserves are exhausted, monthly payments will have to be cut about one-fifth. Despite the projected shortfall, Democrats in Congress have begun to argue that Social Security benefits should be expanded rather than cut. Senators Bernie Sanders and Brian Schatz have offered proposals to boost monthly pensions while at the same time shoring up Social Security finances through tax hikes on high-income Americans. That Democratic voters and lawmakers embrace these ideas is not surprising. But opinion polling suggests such reforms also enjoy broad support among self-identified independents and Republicans. For example, 57 percent of Republicans (versus 71 percent of Democrats) favor increasing cost-of-living adjustments in the benefit formula. Forty-eight percent of Republicans (versus 67 percent of Democrats) favor boosting the minimum benefit available to low-wage workers who have contributed for many years to the program. Seventy-four percent of Republicans (versus 88 percent of Democrats) favor raising taxes in order to protect benefits. These polling numbers were obtained in 2013, but more recent polls show similar opinions. Even if debates among Washington insiders and GOP lawmakers focus on how to trim benefits in order to keep Social Security solvent, poll results suggest Senator Sanders holds views closer to those of the typical voter. One question for both voters and policymakers is whether the aged population is really the most deserving target for additional government spending. Much of the discussion of voter disaffection in the current election cycle has focused on the stagnation of middle class incomes and the rise in inequality. While these represent major problems for families headed by a working-age person, they have not been notably troublesome for the nation’s elderly. The incomes of the elderly, unlike those of the nonelderly, have increased steadily over the past three or four decades. For low- and middle-income retirees, incomes have clearly improved. The same cannot be said for the incomes of low- and middle-income working-age families. Income inequality among the elderly has increased, to be sure, but much more slowly than among working-age families. In new research with my colleagues Barry Bosworth and Kan Zhang, I have examined trends in real incomes and inequality among the nation’s elderly and compared them with the same trends in working-age families. We show that inequality has increased among both the elderly and nonelderly, but it has increased much faster among families headed by prime-age and younger adults than among families headed by someone past age 62. More to the point, real money incomes have increased much faster among middle- and low-income aged families compared with middle- and low-income working-age families. Our estimates of the annual rate of change in real money income are displayed in the chart below. The changes are estimated over the period from 1979 to 2012 based on data reported in the Census Bureau’s annual income survey. The top panel shows changes in families with a head who is less than 62. The bottom panel shows changes in families with a head older than 62. 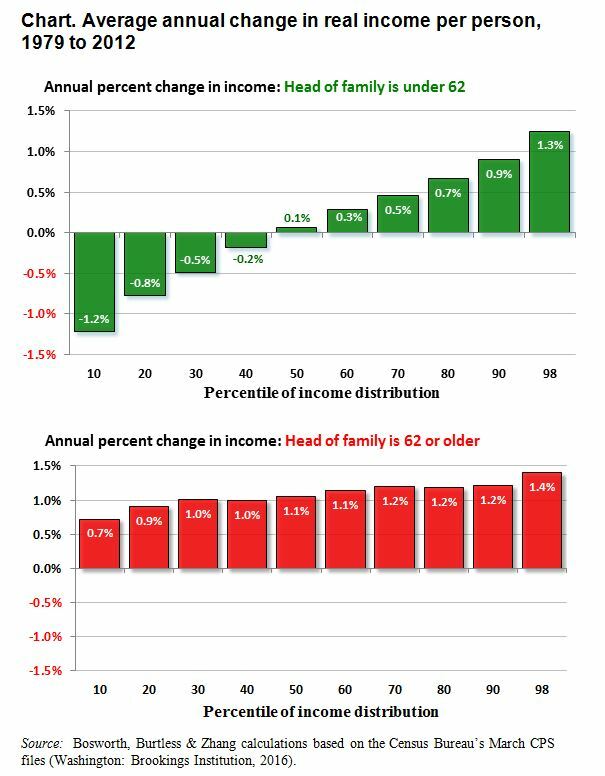 Each bar shows the annual rate of change in real income at the indicated position of the income distribution, either for nonaged families (in the top panel) or for aged families (in the bottom panel). At the top of the two income distributions—that is, at the 98th income percentile—real income gains are virtually the same in the two groups. Further down the income ladder, the income gains differ noticeably, with bigger differences the further down we go. Middle- and low-income working-age families have clearly fared much worse than families with an equivalent position in the old-age income distribution. Estimates of income growth based solely on pre-tax cash incomes, such as the ones in the chart, almost certainly understate the improvement families have seen in their living standards, as I have argued elsewhere (here and here). However, the understatement is bigger in the case of elderly and low-income Americans than it is for the nonelderly and affluent. If we adjust family incomes to reflect the taxes families owe and the monetary value of their noncash benefits, the relative improvement in the standard of living of older Americans is even greater than is shown in the chart. Under almost any plausible income definition, the elderly have fared better than the nonelderly, especially at the bottom of the income distribution. The income statistics do not prove the policy reforms urged by Congressional Democrats are unneeded or undesirable. Their proposals spring from an accurate reading of a long-term trend toward less pension coverage — ironically, a trend that has mainly affected working-age adults. Whereas workers in the 1950s through the 1970s enjoyed continuous improvement in their access to employer-provided retirement benefits, the improvement ceased after 1980. Since that time, private-sector workers have seen reductions in the coverage and generosity of their employer-sponsored pensions. If the private sector voluntarily provides less retirement protection, it does not seem unreasonable to expect the government to provide more. A crucial reason the nation’s elderly population fared better compared with the nonelderly after 1980 is that Social Security and Medicare provided them government protection that was far more generous (and more costly to taxpayers) than the protection available to working-age adults and their youngsters. The gap was especially glaring in the case of families headed by low-wage breadwinners, who have suffered sizeable reductions in pay and employment opportunities. In the years since 1980, their losses have been only modestly compensated through changes in the tax code and expansions of public health insurance. Changes in the labor market make it important to protect future retirement benefits provided through Social Security. The same labor market developments make it even more urgent to expand the employment opportunities and improve the protections and work supports offered to working-age breadwinners. In 2016, the weakening of future income protection for the aged is mostly theoretical. In contrast, the sinking fortunes of less skilled working-age adults are anything but theoretical. They are plain to anyone who can read Census and Bureau of Labor Statistics reports. If taxpayers can identify additional resources to pay for major new initiatives, my vote is for programs that improve the prospects of struggling wage earners. The equity arguments for such an initiative seem to me more persuasive than the case for an across-the-board benefit hike targeted on retirees.